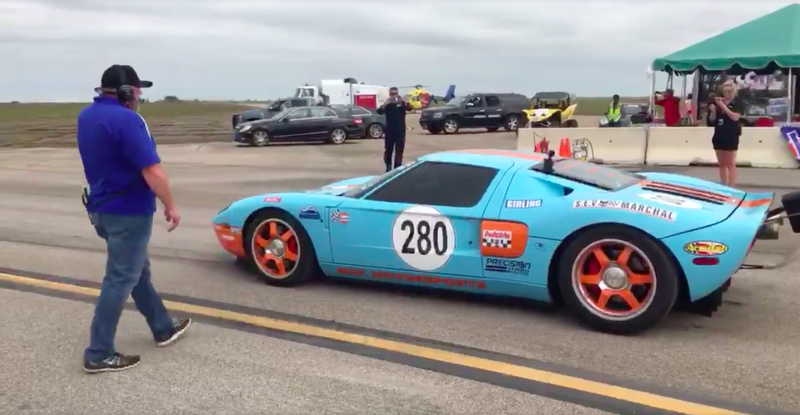 This weekend’s Texas Mile event saw a heavily modified Ford GT from M2K Motorsports hit 293.6 mph, the latest in a round of standing mile and other events where a Ford GT comes to dominate everyone. The old Ford GT is, in my opinion, now the fastest car in the world. Having been to the Texas Mile and other events the Ford GT seems to be the fastest way to standing mile glory. There’s the M2K Motorsports car, crazy Johnny Bohmer’s slippery NASA GT allegedly street legal car, and any number of other GTs so fast they have to seriously worry about bird-strike. Many of you would argue for a Nissan GT-R and I would say, yeah, a Nissan GT-R is pretty quick, but the fastest standing-mile time I’ve seen for a GT-R is this one running about 260 mph. And the Bugatti Veyron? An incredible engineer achievement, but to get that speed you need a giant straight and banked circuit with a 120 mph running start. Could one make a Veyron faster in a standing mile? Probably, but the things you’d have to do to it would ruin it. That’s the genius of the old Ford GT in this context. The cars themselves are gorgeous and exotic but not so gorgeous or exotic that people aren’t willing to do terrible, unspeakable things to them (and this MotoIQ article can run you through all the wonderful and insane mods). They’re mid-engined, extremely aerodynamic, and fairly straightforward platforms for modification. They’re also just old enough that it’s not entirely sacrilegious to utterly destroy any drivability. The new Ford GT, frankly, may never reach that point. We’re seeing cars scratching towards 300 mph that look, at least aesthetically, similar to their stock counterparts. Oh you have a 1,000-horsepower Ford GT? That’s nice. The car above is probably closer to 2,500 but we won’t know for sure because there isn’t a dyno powerful enough to measure it. All quantifications like these are inherently arbitrary. Why is a car that’s faster to a mile suddenly better than a car that’s faster to a quarter-mile or 60 mph? It’s not, but the standing mile is probably the best measurement we’re going to get because it’s the longest stretch of commonly available asphalt since Volkswagen owns the longest test track and the other facilities are basically places where they could land space shuttles. I’m therefore comfortable stating the old Ford GT is actually the fastest car in the world. Fight me. 2017 Fiat 500X: Will It Baby?